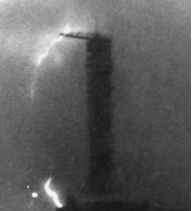 The launch tower hit by the same lightning discharge that disrupted Apollo 12.
however, was a way to ensure that the CM would turn to face the correct direction after being pulled from an aborting Saturn. This was because tests had shown that at hypersonic speeds, it was possible for the CM/escape tower combination to be stable in a nose-first attitude. The tower could not be safely jettisoned in this mode because the airflow would ram the boost protective cover onto the CM hull, which would not only prevent the tower pulling away but also prevent the parachutes from deploying. 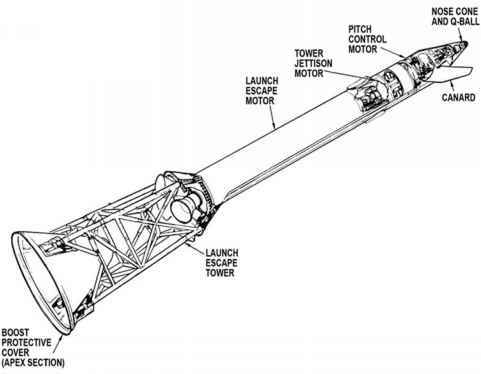 Once the escape tower had pulled an aborting spacecraft free in a one-bravo abort, two skin sections near the top of the escape tower, known as canards, would deploy after the launch escape motor had done its job, creating drag and thereby forcing a turn-around manoeuvre, if one were needed, to face the heatshield in the direction of travel, and allow deployment of the parachutes.